The SELinux X-Windows (XSELinux) implementation provides fine grained access control over the majority of the X-server objects (known as resources) using an X-Windows extention acting as the object manager (OM). The extension name is "SELinux". This Notebook will only give a high level description of the infrastructure based on the X-Server and XSELinux Object Manager X-Server and XSELinux Object Manager diagram, however the "Application of the Flask Architecture to the X Window System Server" paper has a good overview of how the object manager has been implemented, although it does not cover areas such as polyinstantiation. The X-Windows object classes and permissions are listed in the X Windows Object Classes section and the Reference Policy modules have been updated to enforce policy using the XSELinux object manager. On Fedora XSELinux is disabled in the targeted policy but enabled on the MLS policy. This is because Red Hat prefers to use sandboxing with the Xephyr server to isolate windows with the targeted policy, see the Sandbox Services section for details. It is important to note that the X-Windows OM operates on the low level window objects of the X-server. A windows manager (such as Gnome or twm) would then sit above this, however they (the windows manager or even the lower level Xlib) would not be aware of the policy being enforced by SELinux. Therefore there can be situations where X-Windows applications get bitter & twisted at the denial of a service. This can result in either opening the policy more than desired, or just letting the application keep aborting, or modifying the application. The Policy - The Reference Policy has been updated, however in Fedora the OM is enabled for mls and disabled for targeted policies via the xserver-object-manager boolean. Enabling this boolean also initialises the XSELinux OM extension. Important note - The boolean must be present in any policy and be set to true, otherwise the object manager will be disabled as the code specifically checks for the boolean. libselinux - This library provides the necessary interfaces between the OM, the SELinux userspace services (e.g. reading configuration information and providing the AVC), and kernel services (e.g. security server for access decisions and policy update notification). x_contexts File - This contains default context configuration information that is required by the OM for labeling certain objects. The OM reads its contents using the selabel_lookup(3) function. XSELinux Object Manager - This is an X-extension for the X-server process that mediates all access decisions between the the X-server (via the XACE interface) and the SELinux security server (via libselinux). The OM is initialised before any X-clients connect to the X-server. The OM has also added XSELinux functions that are described in Table 1 to allow contexts to be retrieved and set by userspace SELinux-aware applications. XACE Interface - This is an 'X Access Control Extension' (XACE) that can be used by other access control security extensions, not only SELinux. Note that if other security extensions are linked at the same time, then the X-function will only succeed if allowed by all the security extensions in the chain. This interface is defined in the "X Access Control Extension Specification. The specification also defines the hooks available to OMs and how they should be used. The provision of polyinstantiation services for properties and selections is also discussed. 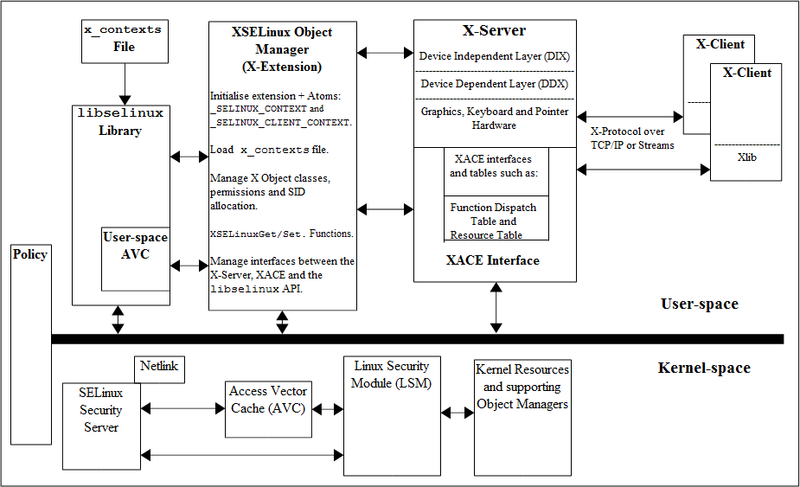 The XACE interface is a similar service to the LSM that supports the kernel OMs. X-server - This is the core X-Windows server process that handles all request and responses to/from X-clients using the X-protocol. The XSELinux OM is intercepting these request/responses via XACE and enforcing policy decisions. X-clients - These connect to the X-server are are typically windows managers such as Gnome, twm or KDE. Kernel-Space Services - These are discussed in the Linux Security Module and SELinux section. The OM / XACE services support polyinstantiation of properties and selections allowing these to be grouped into different membership areas so that one group does not know of the exsistance of the others. To implement polyinstantiation the poly_ keyword is used in the x_contexts file for the required selections and properties, there would then be a corresponding type_member statement in the policy to enforce the separation by computing a new context with either security_compute_member(3) or avc_compute_member(3). Note that the current Reference Policy does not implement polyinstantiation, instead the MLS policy uses mlsconstrain rules to limit the scope of properties and selections. How to enable/disable the OM X-extension. How to determine the OM X-extension opcode. How to configure the OM in a specific SELinux enforcement mode. If the boolean is set to false, the x-server log will indicate that "SELinux: Disabled by boolean". Important note - If the boolean is not present in a policy then the object manager will always be enabled (therefore if not required then either do not include the object manager in the X-server build, add the boolean to the policy and set it to false or add a disabled entry to the xorg.conf file as described in the Configure OM Enforcement Mode section). If there is no entry, the object manager will follow the current SELinux enforcement mode. The object_name can contain '*' for 'any' or '?' for 'substitute'. The OM uses the selabel functions (such as selabel_lookup(3)) that are a part of libselinux to fetch the relevant information from the x_contexts file. The valid object_type entries are client, property, poly_property, extension, selection, poly_selection and events. The object_name entries can be any valid X-server resource name that is defined in the X-server source code and can typically be found in the protocol.txt and BuiltInAtoms source files (in the dix directory of the xorg-server source package), or user generated via the Xlib libraries (e.g. XInternAtom). The way the XSELinux extension code works (see xselinux_label.c - SELinuxAtomToSIDLookup) is that non-poly entries are searched for first, if an entry is not found then it searches for a matching poly entry. The reason for this behavior is that when operating in a secure environment all objects would be polyinstantiated unless there are specific exemptions made for individual objects to make them non-polyinstantiated. There would then be a 'poly_selection *' or 'poly_property *' at the end of the section. A full description of the x_contexts file format is given in the x_contexts File section. Table 1: The XSELinux Extension Functions - Supported by the object manager as X-protocol extensions. Note that some functions will return the default contexts, while others (2, 6, 9, 11, 16, 18) will not return a value unless one has been set the the appropriate function (1, 5, 8, 10, 15, 17) by an SELinux-aware application. XSELinuxSetDeviceCreateContext 1 Context+Len Sets the context for creating a device object (x_device). XSELinuxGetDeviceCreateContext 2 None Retrieves the context set by XSELinuxSetDeviceCreateContext. XSELinuxSetDeviceContext 3 DeviceID + Context+Len Sets the context for creating the specified DeviceID object. XSELinuxGetDeviceContext 4 DeviceID Retrieves the context set by XSELinuxSetDeviceContext. XSELinuxSetWindowCreateContext 5 Context+Len Set the context for creating a window object (x_window). XSELinuxGetWindowCreateContext 6 None Retrieves the context set by XSELinuxSetWindowCreateContext. XSELinuxGetWindowContext 7 WindowID Retrieves the specified WindowID context. XSELinuxSetPropertyCreateContext 8 Context + Len Sets the context for creating a property object (x_property). XSELinuxGetPropertyCreateContext 9 None Retrieves the context set by XSELinuxSetPropertyCreateContext. XSELinuxSetPropertyUseContext 10 Context + Len Sets the context of the property object to be retrieved when polyinstantiation is being used. XSELinuxGetPropertyUseContext 11 None Retrieves the property object context set by SELinuxSetPropertyUseContext. XSELinuxGetPropertyContext 12 WindowID + AtomID Retrieves the context of the property atom object. XSELinuxGetPropertyDataContext 13 WindowID + AtomID Retrieves the context of the property atom data. XSELinuxListProperties 14 WindowID Lists the object and data contexts of properties associated with the selected WindowID. XSELinuxSetSelectionCreateContext 15 Context+Len Sets the context to be used for creating a selection object. XSELinuxGetSelectionCreateContext 16 None Retrieves the context set by SELinuxSetSelectionCreateContext. XSELinuxSetSelectionUseContext 17 Context+Len Sets the context of the selection object to be retrieved when polyinstantiation is being used. See the XSELinuxListSelections function for an example. XSELinuxGetSelectionUseContext 18 None Retrieves the selection object context set by SELinuxSetSelectionUseContext. XSELinuxGetSelectionContext 19 AtomID Retrieves the context of the specified selection atom object. XSELinuxGetSelectionDataContext 20 AtomID Retrieves the context of the selection data from the current selection owner (x_application_data object). XSELinuxGetClientContext 22 ResourceID Retrieves the client context of the specified ResourceID. This page was last modified on 25 September 2015, at 14:05. This page has been accessed 44,801 times.